When I graduated Tufts in 1993, the farthest thing from reality was returning to Iran. Iran had practically become a dream now, an invented product of childhood imagination. Still, this land of my dreams was all I thought about. My passion for return was so great, it hurt. The only thing greater than that pain was the fear that I rarely even allowed myself to think of: what happens if I someday return and find out that everything has changed? Then I will be left dry, without a dream, a hope, a home. My post-graduation life was mapped out well: I had secured a position with an international NGO (non-governmental organization) in Cairo, were I would work for two years; then I would go to graduate school and wind up in the U.N. or another international aid organization. I never even applied to a single job in the States. It was time to go, to learn as much as I can about my roots. Egypt was the closest I had to Iran and after spending a year there during my junior year in college, it was familiar. I reported to my job on the first of September, during the height of the summer heat. Life was comfortable. Although I planned to get my own flat, for the time being it was too hot to search. My father was the UNICEF Representative there, so, life was indeed comfortable. But work was not what I thought it would be. I was not used to such disorder and low productivity. Something else occurred to me: all the people who are running these development organizations are either foreigners, foreign educated, or from a select class of society. No one seemed to be there to voice an opinion from the target group -- the poor and deprived. They said things would pick up, but right then I had so much time on my hands, all I could do is think about life. One day, as I was reading the documents on various projects, a flash of clear entered the chaos that haunted my thoughts. "What are you doing here? ", I asked myself. "To learn about Egypt? Have you ever bothered to learn anything about Egypt? Or are you depriving yourself the opportunities in your life with this obsession about Iran?". My conviction must have been apparent in my eyes for my parents actually listened. They were afraid of what I was about to do, but without doubt supportive. They talked to me, kept telling me I can change my mind, and when they found out I was not about to, they respected my decision. They asked only that should I change my mind about all this, not to be stubborn and ask them for the money to buy an exemption. The next day I quit my job and a few days after that, I had something I never thought I would see: a plane ticket with Tehran as the destination, with my name on it. I will never forget boarding that plane. The look of concern in my parent's eye, the feeling I had, .... I was going back to the land I practically fled at age twelve. The ticket was one-way. I had no clue what to expect, but six hours of transit time in Kuwait certainly had my imagination going. I stepped into the airplane from Kuwait to Tehran on final call, right after reminding myself this was the last time to change my mind. I could not believe it: I was in Mehrabad Airport. Would they ask me questions at the passport control? Are they going to give me a notice to report for service right here? To my surprise, the officer said nothing after I answered "10 years" to his question on how long I had been out of the country. Then there was customs. "Do you have any foreign goods? ", asked an old, ill-humored man. "I left when I was 12, everything that still fits me is Iranian, the rest is foreign...". Again, no particular response as I was waived in. A few dozen relatives stood with smiling faces behind the glass and rushed to greet me as I got out of customs. Wow, everyone had grown so much! For a few months, or maybe longer, I was in a complete daze. I could not remember most streets, or even the names of half of my distant relatives. It was so strange, this place existed! As did all the uncles, aunts, and cousins I loved so much. There they were. After a few weeks it occurred to me that I have to figure out what to do now. What are my options? I insisted on going alone. "I have come here to learn about Iran and development, I have to face the bureaucracy and the problems if I want to learn how to improve it...," I would say to offers of help. My relatives found humor in my approach and let me do as I wanted. Well, most did, and the rest I politely ignored. I never imagined it would be so hard. First, my shenasnameh (birth certificate) was from the Shah's time and no longer valid. So, I had to change that. Then I headed to the draft office to learn about my status. After waiting on a line for two hours, I entered a room occupied by a colonel. I gave him an enthusiastic introduction to my odyssey only to be hear: "So, why are you saying all this to me, I am not in charge of such affairs. You are in the wrong room. Get out!". It took an hour or so just to find out who to ask where to go and ask questions. I found out that I must first get my degree certified genuine in the States, then, give it to the Ministry of Education to evaluate and only then come here. A couple of months went by waiting for these documents to clear. I will guarantee that you will never forget the day you get your draft papers. You enter rooms which are divided according to your date of birth and someone asks your name and shenasnameh number. I was in the middle of telling them that there is no way that they will find my name in any of those hundreds of binders that occupied the shelves of the room that the solider found me. It took under a minute. I was so scared. How was it that my name was in this God-forsaken building which until that moment I thought was an unorganized zoo? I could not sleep for a week. In between sorting that mess, I started asking around. Someone told me that universities and government offices take people who return from abroad to teach English or work. So, I started asking around about these options. Surely enough, a law existed that allowed government entities to request a mandate from the Commander-in-Chief's Office which would allow a person to serve their duty there, after training. But things are never as easy as that in Iran. A lot of people gave me fantastic advice and everyone introduced me to anyone they knew who could help. Slowly I made a list of all the entities which would possibly want me and went door to door, or rather contact to contact. Some places brushed me off, but most had me come in and talk, but that is not surprising since they were people who were introduced by friends. First, one has to get a specific office in a government entity to say they need that person. Then, your file gets passed on to the deputy minister of that division. Depending on the relationship of the person who requested you and the deputy, chances improve or fall. Then, if the request is granted, that deputy writes another deputy who is in charge of "Draftees Affairs" and the process goes on. After a string of similar events, the Ministry finally sends an official request to the Commander-in-Chief's Office. But that is just the tip of the iceberg. The hardest part is getting the approval of that office. I cannot tell you what it took to do this. No, really, I can't. Just keep in mind that some of the ministries require a 2-3 year commitment to work there after your national service is done. It was scary being in a government office and talking to officials, even petty ones. I kept making mistakes in Persian and saying the wrong thing to the wrong person. The next step is to get the approval of "gozinesh". The word sounded as unfamiliar to me as it does to most of you. Trained by the Egyptian system, I had learned never to leave any papers on someone's desk. It was so easy to get lost, and this being my tale, I got lost in the "herasat" wing (much later I learned that means security or the boys who enforce Islamic codes). Anyway, I asked a young bearded chap were this gozinesh room is and, in typical Iranian fashion, he started asking me curious questions. Before long, he took my entire file and read it and we had a nice conversation about returning from abroad. He seemed to like my insanity and simply could not believe I returned to Iran when my parents were not even there. Now that we were such good friends, I asked him what in the world this gozinesh thing is anyway. I was horrified to learn that that is the selection board, as in ideological selection! My new friend told me not to worry, he has an old college buddy there and he will hook me up. I did not chance it and studied for ten days before the set test. But surely enough I was asked very simple questions and the guy said it should not be a problem. Two weeks before my draft date, after everything had gone through, I learned that I had failed the ideology test! What a mess that was! But, with luck that could have been heaven sent, I went in and talked my way around it. Getting drafted can be much more organized. You are given a piece of paper and are told to report to Vali Asr Barracks on the draft date to be divided into a military unit. They do not exactly give you a map of this place. Needless to say, when the day came I was wondering with a crowd of other clueless draftees, looking for the right place at 5 am. Some people had bags with them, not knowing if they will be taken that day or not. Officially, your service has started. But that day, you are only told which force you will serve under, the regular army or the sepah (revolutionary guards). Placed into the army, I was to report to another building in eight days. Eight days later, still not expecting to actually be taken, I found myself searching for another military base in Tehran. There, you are once again divided between ground, air, and naval forces. I was given to the ground forces, which as my luck had it, included the longest training. I was to suffer six months before going to the ministry. That same day, they took us to our station. We were now divided into platoons and companies. Then, they give you some clothes, without bothering to check the size, and tell you how to sew the various badges on, and also the name of the district where they exchange clothes for a fee in Tehran. We were to alter the clothes and return in five days dressed in them, sporting a buzz. The clock moved and reporting time got closer. One day, I was sitting in a gathering, sporting my aragh sagee (hard liguor) and I noticed it was time to go shave my hair. I should warn all you guys, the girls do not look at you as much of a catch after that and the having-returned-from-abroad thing wears out. In any case, I believe that day I became the first to have completed Tufts' Peace & Justice Program and wore the drabs of the Ground Forces of the Islamic Republic of Iran. Nothing is as scary as entering bootcamp. I started in the middle of Ramazan and winter. (Another advice: invest in a ski hat, it is cold without hair and use a meat masher to soften those boots BEFORE bootcamp -- you would not want to see what my feet turned into.) I was scared, wondering if I should tell them about having been abroad or not? Well, it comes out rather quick. The first line of conversation generally starts with what have you studied and where, not to mention they make you fill out forms that ask about everything. I thought I was going to be in a lot of trouble answering truthfully on some of the questions like "Do you have any members of your family who were part of the former regime." Truth is, I received mostly curiosity. Most of the time I was treated nicer if anything for coming from abroad (save for my commanding officer at bootcamp). Soon, everyone in our platoon knew me. What I did not know and was not happy to learn was that there are written exams in bootcamp. Guess how I felt about taking notes on military tactics and equipment with the state of my Persian! Again, there was horror in my eyes when I found out I will have Islamic Ideology classes and exams. But to be honest I valued those classes the most. No one in the military treats you as well as the mullah who teaches that class. What I mean is, if you doze off in any class, be prepared to run around the grounds or something; except for the ideology class, where the mullah does not care if the entire class puts their head on the table and sleeps. They did. 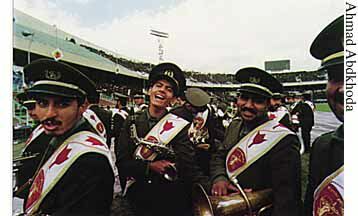 After bootcamp, I was stationed in Shiraz for officer training. Unfortunately, the ground forces do not provide transportaion. They simply give you a little compensation money which you receive 4-5 months later. I bought a plane ticket not knowing how in the world I was going to find this place knowing only the name of the barracks, and nothing about the town. It turned out that everyone knows where these places are in smaller cities. Did I ever learn about development in the provincial cities of Iran. After three months in Shiraz, Tehran seemed like an amalgamation of Paris, New York and Los Angeles! A few weeks before training ended, I asked someone to make sure my mandate was is order. It wasn't. There are so many tales in the army about these mandates. Your superiors tell you they can revoke them, but it does not make sense that a lower body can revoke the authority of the Commander-in-Chief's Office. I am not sure to this date what happened. I do know that after every step I was told it was now final and definite, only to encounter a new problem. In Iran nothing is finished until it's finished. Shiraz was a stressful time, not knowing what will become of me. If the mandate would not come through, I would be divided by class rank. Now, I did fine on my exams, relatively speaking. Still, given that those who are the only sons of the family choose first, I could hope for Kerman at best. The two hours it took in the final division room seemed like an eternity to me. My name was called very last on the roll of people whose mandate arrived. Still, it was sad to leave Shiraz for I had met the most beautiful girl. We would meet in the restuarant of Homa Hotel, where I hoped the komiteh would frequent less because of the tourists and just talk for hours over dinner. To think what they would have done to me if they caught me while a solider! But at the time I literally forged a signiture to get off grounds to meet her. The two-and-a-half years I spent in Iran are marked by some of the best memories of my life. In Iran you are either experiencing heaven or hell. There are very few in-betweens. I miss it now. Bootcamp and officer training, although rigorous and hard, served as the best classroom I could imagine to reintroduce me to Iran. I was able to live with and get to know the Iranian youth in a setting that overcame the strong class and ideologically segregated system present in the Iranian society. The entire mosaic of Iran was present: Persians, Azaris, Kurds,..., and I had a chance to get an experience no internship could provide. Most important, I found peace within myself. Returning to Iran makes one appreciate all the things we have here; basic things and freedoms which most of the Iranian youth are deprived of. It certainly puts life in perspective. All-the-same, if anyone has the idea of doing such a crazy thing as to return to Iran without paying the Islamic Republic off for an exemption, and has questions, feel free to contact me.